Indeed, this is right on time, incredibly accurate, and he’s a welcome visitor in Wendiland this morning. I haven’t drawn him yet in the Daily Dose posts I’ve done here, but I know him well and had written a poem long ago based on his energy: The Hermit’s Cave. The Nine represents the final phases of a cycle. This is the reflective period where you must ask yourself what was gained from the experience, what was lost in the experience, and how it all weighs out on the scale of life. It’s a search for a higher wisdom, a treck into self to find one’s true purpose in the over-all scheme of things. Unlike depression-spawned solitude, this Hermit seeks out silence so that he can hear the Voice of the Universe, uninterrupted. A robed man or monk carrying a lantern. A barren landscape. After a long and busy lifetime, building, creating, loving, hating, fighting, compromising, failing, succeeding, the Fool feels a profound need to retreat. In a small, rustic home deep in the woods, he hides, reading, cleaning, organizing, resting or just thinking. But every night at dusk he heads out, traveling across the bare, autumnal landscape. He carries only a staff and a lantern. It is during these restless walks from dusk till dawn, peering at and examining whatever takes his fancy, that he sees and realizes things he’s missed, about himself and the world. It is as if the secret corners in his head were being slowly illuminated; corners he never knew existed. In a way, he has become the Fool again; as in the beginning, he goes wherever inspiration leads him. But as the Fool, his staff rested on his shoulder, carrying unseen his pack. The Fool was like the pack, whatever it was he could be was wrapped up, unknown. The Hermit’s staff leans out before him, not behind. And it carries a lantern, not a pack. The Hermit is like the lantern, illuminated from within by all he is. In regards to people, the Hermit represents a wise, inspirational person, friend, teacher, therapist, someone the Querent usually sees alone, someone the rest of the Querent’s friends and family may not know about. This a person who can shine a light on things that were previously mysterious and confusing. They will help the Querent find what it is they are seeking. One of the important things about this card is that the Hermit is always shown on the move. He’s never locked away in his reclusive cell, he’s always out wandering, searching. That, to me, is a Virgo. I’m married to one, I know. The Hermit is the restless mind of the Virgo, always gathering information, analyzing, making connections. Virgos are skeptics, and if anyone is going to stick a lantern into a dark place and take a good look at what’s going on, it is a Virgo. 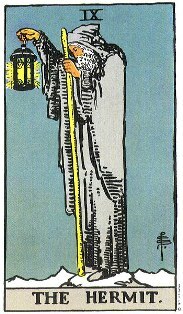 The Hermit is a card of connections and enlightenment. Combined with a desire to just “be alone,” the Querent who gets this card is probably feeling impatient with people who disturb their peace or who can’t see what they’re seeing (“Are you blind?” might be their refrain, or, more typically, “You just don’t get it, and I can’t explain it to you.”). In typical Virgo fashion, they’re likely to be grumpy and anti-social. But for the Querent (if no one else!) this is a special time. Like an artist who hides for days then emerges to paint a masterpiece, this quiet time allows all the pieces to fall into place. So go ahead and encourage them to go on late night drives, long walks, hide in their room or go on retreat for a month. When they come back, they’ll see everything in a brand new light. It’ll be the best thing for them, and for everyone else in their lives. As a temporary vibration: Changes, endings, inspiration. Events take place quickly at this time, with many stops and starts, because you are experiencing a period of change and transition. As Paul Case says in The Tarot, “You must make the final selection between assimilable material and what is rejected as waste.” Eliminating the useless, and separating yourself from past mistakes can be an emotional experience, for we often are reluctant to let go of the obstacles in our lives. If you cannot free yourself from associations and situations that are no longer necessary for your development, then the 9 cycle will do it for you. A vacation or trip would be good therapy at this time, giving you time to think and separate yourself from the emotionalism you might encounter under this vibration. Many of your goals will be realized during this time, and you should attempt to finish all projects that are close to completion. As this is an ending cycle, do not make new commitments. Projects begun under a 9 have little durability. Present friendships can be cemented and made more enduring, and you may receive gifts from friends. This should be a charitable time, in which you think primarily of other people’s welfare. Do something for others in thanks for the blessings you have received in this life. An old friend or lover may enter your life briefly for one last encounter, but don’t expect this sudden renewal to last. Since this is an ending cycle, you may change jobs or residence. Children may leave home for higher education or marriage, or to begin their own lives. If you are separated from the people, situations and locations with which you have lived for a long time, it is because they no longer serve your evolutionary process. Use the creative powers of this vibration to develop your artistic abilities. You will have inspirational ideas that can be used productively in the future in a way that the next cycle’s number will determine. Don’t be caught by your emotions. Hanging on to the past, wallowing in what used to be can only bring discontentment, frustration and depression. Rather, look forward with joy and high expectations to the future, for which the releasing energy of this cycle has prepared you. Use the wisdom provided by the events of this cycle to inspire your actions productively in the future. TAROT SYMBOLISM: Key 9, The Hermit – The symbol for key 9 is the yod, the tongue of flame, the glyph that makes up every letter in the hebrew alphabet. It represents the fiery energy, the life force, and the hand, opened rather than closed, of man and woman. In the body we are little serpents, containing a portion of the one Source’s fiery energy. As such, we are the hands of God operating in the physical world. The Hermit is a symbol of ageless wisdom, standing on the mountain of attainment. He has achieved. The snow represents the isolation he endures because his wisdom sets him apart from others. However, as he turns to shine his light on those who follow him, he intimates that our knowledge is empty and meaningless until we turn and give it to others. The Hermit has evaluated, selecting the necessary and discarding the unecessary elements along his path. He has learned to use the Magician’s wand, which he now leans on, for he knows he can depend upon it for support. He has achieved mastery. ASTROLOGICAL CORRESPONDENCE: Sun (And Virgo). The Sun is assigned to 9 because it is only after you carefully progress through the previous steps, 1 – 8, that you can attain a position of respect and leadership, as well as a full recognition of your inner potential. The true inner self is expressed under a 9, as you become the humanitarian, the universalist who reaches out to the multitudes to lighten their burdens through your understanding, wisdom, and compassion. Virgo’s assignment indicates that careful, thorough analysis has preceded this final position of authority. Any mistakes along the path could have led the aspirant astray; therefore, keen discrimination is necessary at all times.